One thing even mainstream German brewers like to add a bit of variety with is Bock. The rest of the year it's nothing but boring Pils and Weizen for most of them, but come late Autumn and then moving into winter, many turn to a Bock or an even stronger Doppelbock** to be their seasonal special. 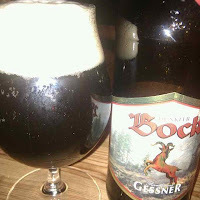 I've written before about the origins of Bock, and the strong dark ale that gave it the name. Today though it is really just a codeword for a stronger more flavoursome beer, hence the appearance of light Heller Bocks - most Maibocks, Lentebocks and Frühlingsbocks (Easter Bocks) fall into this category - alongside the more traditional darker Dunkelbocks. For the best-known names in Bock, such as Andechser and Einbecker, it is a year-round thing, and we beerlovers are all the richer for it. For some, it is both year-round and seasonal, typically with a Winterbock and a Maibock, and perhaps a Festbock or strong Märzen as well. But for others - such as Störtebeker up on the north coast, with its Stark-Bier that is technically a Bock but which is so dark, rich and flavoursome that it could easily be taken for a Baltic Stout - Bock means winter. To be realistic, some of the newer Bocks smack of big brewers trying to ride a band-wagon. Straight off, I can think two unimpressive examples produced by Carlsberg at the Holsten factory, say. And as usual with anything approaching decent beer in Germany, you're extremely unlikely to find Bock on draught outside one of the more adventurous brewpubs - the draught market is largely sewn up by the golden fizz. But for all that, there are some seasonal Bocks that are simply wonderful. Give them a go if you get the chance! **Talking of names, a common one for a Doppelbock is something ending in -ator. 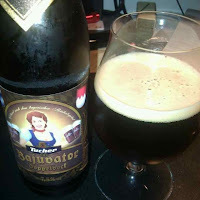 Think Salvator, Triumphator, Celebrator, Bajuvator in the photo above, and one of my locals, Nikolator. No-one seems to know why, except that Salvator set a fashion.